AN independent travel firm has given first class makeovers totaling almost £200,000 to three of its Wirral stores. Hays Travel has spent six weeks transforming their stores in Birkenhead, Prenton and Bebington, to bring them in line with the four other branches in the region. The Mayor and Mayoress of Wirral, Councillor Geoffrey Watt and his wife Anne, were VIP guests at the Birkenhead branch, in Pyramids Shopping Centre, to see for themselves the £75,000 refurbishment recently completed there as part of the refurb programme. 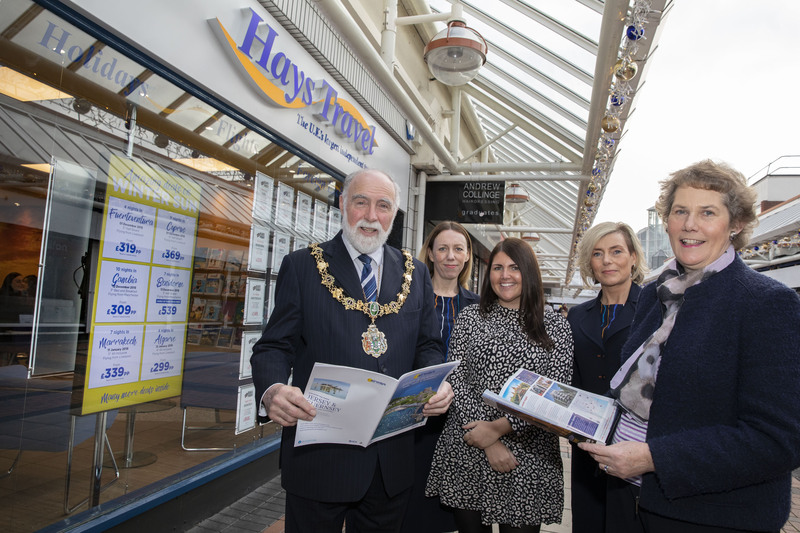 Councillor Geoffrey Watt, Mayor of Wirral, said: “Hays Travel in Birkenhead looks fantastic following its recent transformation. It’s clearly been a high quality refurbishment which looks modern and inviting. The Mayoress and I thoroughly enjoyed our visit and the team were extremely welcoming. The refurbishment programme at the three stores was part of a £1m spend this year by the firm to improve those in its 32-branch portfolio which were in need of updating. The renovations have seen each store being entirely stripped out and redecorated to include a fresh, high spec interior with new digital window displays and a special designated cruise lounge created in response to the growing demand for cruise holidays. “Refurbishments like these at our stores are important for a number of reasons. “One of the driving forces for the business is to provide excellent customer service which is why we have so many loyal customers who come back to us again and again to book their holidays. “It’s important to us that we provide them with modern, clean and welcoming stores, where they feel comfortable to come in and talk to us about booking their holiday. Natalie Price, Hays Travel Birkenhead Manager, has worked at the store for 11 years. She said: “It’s a complete transformation, an entirely different shop and it has created a real excitement amongst the team. None of us could sleep the night before we reopened – we were so looking forward to getting up the next day and being in the new store! “The feedback from customers has been terrific. They love it. A lot of my customers have been coming to book holidays with us since I started 11 years ago and they have been amazed by the look of the place. “I think it has also brought some vibrancy to this part of town and the new digital displays and the TV screen in the window have definitely captured people’s attention and brought new people in to the store. Hays Travel North West, which has stores across North Wales and the North West, is the main partner of the hugely successful Hays Travel based in Sunderland which has a turnover of more than £1bn and is the UK’s largest independent travel agency. At the end of last year Hays Travel North West launched a major expansion scheme with the creation of more than 50 jobs and a jump in turnover within 12 months from more than £50m to the predicted end of 2018 turnover of around £73m. In the next 18 months, it is predicted that the number of Hays Travel North West stores will rise to 50.